See below for the text to “Stick” in case you can’t make it out. Stick girl recommends an art club to stick boy…. That Stick strip is pretty good. The expression on the guy with the cat on his head’s face! Oh my god. cat club! *dies*. Ironically, I think I’m a member of both Cat Club and Spinach Club. No one would ever mistake me as a member of Art Club. I love JR’s day care setting, and all the creative responses to Mother’s Day. I’d like to have a “Lois Day” too, but I think what I have in mind is very different from what the kids intend…. 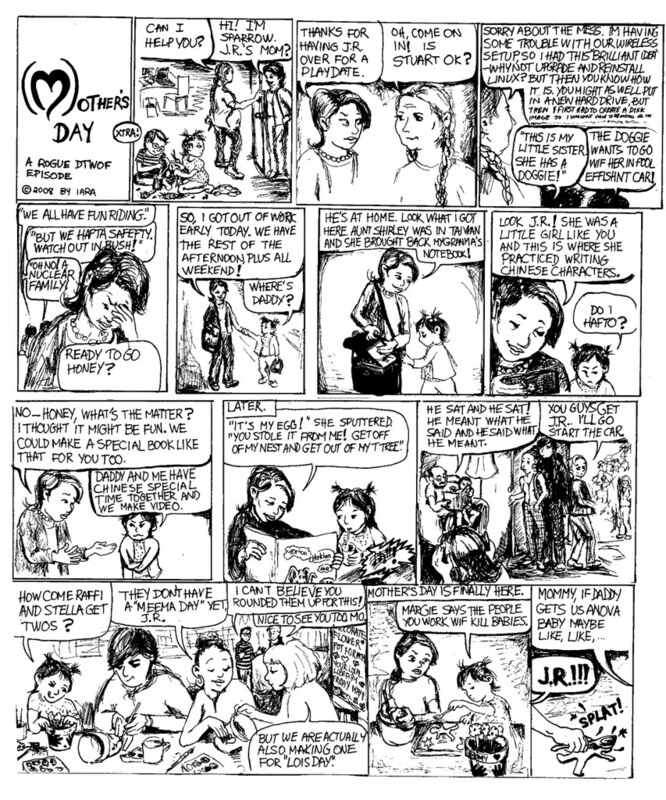 jeez, some people do some great drawing themselves…reminds me of liz feldmann (that writer for ellen de generes)…”mum, when i grow up, i wanna draw like alison bechdel!!”. but anyways, chapeau, i could so not do this! Great stuff, folks 🙂 I think there may be some real momentum to this whole DTWOF fan-fic thing. I don’t have the right skill-set to participate (I’m a graphic designer, and a writer, but in neither case is my ability or approach very applicable to the task). However, As a Web designer, I’m very tempted to set up a site devoted to this. Frankly, if go more than a month without registering an URL, I start to get antsy. And I’m on that trajectory anyway — earlier today, after flipping through “Hot, Throbbing DTWOF,” I was inspired by Anjali’s enthusiasm for creating a MadwimminBooks Web site, and have been thinking about setting up MadwimminBooks.com as a fun exercise in both fanboy timewaste and ironic retro-lamo graphics, recreating all the high-tech gloss and blinking banners of Web design circa 1996. Whaddya think AB, in either case? Fair use? Colossal waste of time and bandwidth? “Go for it”? Affront to the dignity of everyone involved, living and fictional? “Yeah, sure, whatever”? Lawsuit? I honestly haven’t a clue. I’ve never had the urge to run a fan site, so I don’t know what to think. I love how the other child in panel one of “Mother’s Day” looks like a little baby Mo! Alison, what a wonderful community you’ve accidentally built! Everyone wants to pitch in and give you some downtime. Soozie, I’m very impressed with your daughter’s logo design. 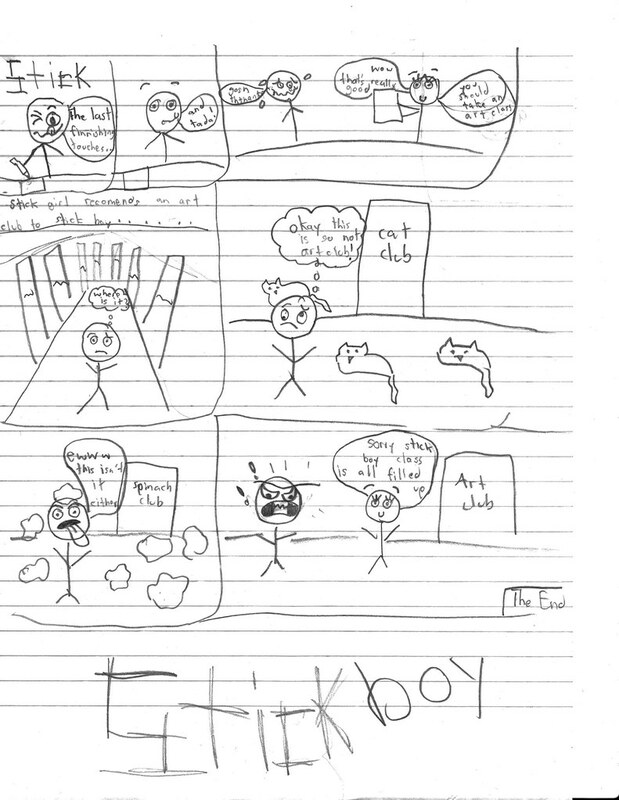 Excuse my poorly drawn cats. They sort of look like slippers I would where to a sleepover! I apologize for being nitpicky about such good work, but doesn’t Sparrow work at a domestic violence shelter, not for a women’s health center that might or might not perform abortions? Or is that the promotion she mentioned in a strip not too long ago? If so, then, well, oops, then. @aunt soozie’s daughter: your cats are purrfect! @anonny mouse: Sparrow quit her job at the women’s shelter a while ago and is now the E.D. for the statewide NARAL Pro-Choice office. (National Abortion Rights Action League). FWIW. P.S. BamfChyck, maybe I’ll see you at SpinachClub meetings! Nice stuff, all of you. And yeah, I’d love to know how one celebrates Lois Day. When I had a housemate, my kids and I would celebrate “David Day” the Sunday before Father’s day, since he was kinda acting in a “faux-father” fashion. (How does one label the relationship between a gay man and his lesbian housemate’s kids, anyway??? I guess that’s another question entirely.) That way, we were able to take advantage of all the stuff on sale for Dad’s day. He moved out a while back, but they still take him out and celebrate the day. Aunt Soozie’s daughter—I loved your strip. Wow! Iara, I am so impressed! This is fantastic! And kudos to Kassie and Aunt Soozie’s kid as well. Aunt Soozie’s daughter: Your cats are the best part! I love how you capture “catness” without being literal. If the “art club” is anything like my art program, ole stickboy is sparing himself alot of frustration with easels that all seem to be broken. And printers that don’t work. … whether or not you feel up to doing a DTWOF strip! You guys are all amazing. I’m in awe. Ha ha — I love Stick Boy! He looks like Popeye with the sailor’s cap in Spinach Club — and WHAT a great expression! I should be so lucky as to have slippers that look like those instantly-recognizable cats (what economy of line)! And that long, institutional hallway with all the closed doors, behind which who knows what mysteries lie! Wow. The “Stick” in the title, spelled out in stick-style, is cute. Oh, Cassie, Iara, I love yours too! Thank you everyone! A couple of years ago I co-started a knitting club in a local pub. I’m actually a terrible knitter; it’s just an excuse for a beer with friends. These days it’s a thriving group for drinkers with a knitting problem. My friend, who has taken over organising it, thought we should bring kittens, you know, to frolic with wool between the tables…for the effect. a kind of cat club, art club, knitting club all in one! dzieger, if you build it, they will come. Remember all the amazing articles and ads that people sent in for the Daily Distress? But IMHO you should wait a bit until after that gets published, and of course should only be done if AB approves. Kassie, I confess to being an arachnid sympathizer, but the panel with the tick being flicked into the toilet cracked me up! And I also love how the eyebrows (along with eyes, mouth and especially his tongue) on Stickboy manage to convey so much – the faces are so very expressive! Eris, it is Sparrow smooshing the cookie – I meant it to be that her hand slipped because she was so upset about what she was hearing from JR. But now that i think about it, it could work the other way too. Thank you very much everybody who liked my fake DTWOF episode. I am really touched that people would actually take the trouble to discuss its goings on as if it were one of the real episodes. I just read the rest of the comments (no comment on my daughter’s!). Isn’t it funny how, no matter where we start on this blog, we find a way to get back to talking about cats! Ha, my cat belongs to a local outdoor club too! I think there are at least 4 members. iara and all the others, thanks for wonderful, wonderful fan-dtwof!! It’s true that from the bubbles we are supposed to understand that it is Sparrow’s hand, but (and I realize I might be warped) I thought J.R. was splattering the cookie person’s head to better express her suggestion to hire the baby killers’ professional skills to get rid of the (hypothesized) new baby dad wants. “Well I’ll be damned,here comes your ghost again…Your poetry is lousy,you said….” Joan Baez crooned in Diamonds and Rust,one of several songs about her relaionship with the irascible,raspy Bob Dylan. Recent interviews show a somewhat mellowed,calmer fellow at 67,who no longer bad-mouths his sister and fellow musicians. His son Jakob has achieved some success with his group The Wallflowers,though I haven’t heard their music. All this has lead me to start writing a piece about the influence of Dylan on my political consciousness. My first date was at the State Theater,near the campus of MSU in E.Lansingm,MI to see the Dylan movie,Don’t Look Back. Keith Clark,who I knew from the Unitarian youth group LRY (Liberal Religious Youth),asked me to go,and I was so nervous with first-date jitters I remember very little of the film. Many years later,I watched it with my late husband,and I understood the film much better. Whoa…(especially to the first one) It’s uncannily Bechdel-esque, but completely different. I love these! Yeah,I also liked the mini-Mo,and the clever insertion of a Mother’s Day gift-making session at the library Mo works at. Though I expected her to rant (as I have)that M.D. is a pale substitute for the day that REALLY honors women,International Women’s Day on 3/8. Giving due credit to feminst/abolitionist Julia Ward Howe,I would prefer getting a paid day off,free lunch,and flowers like the women in more Enlightened countries receive. Though if someone wants to take me out for dinner on M.D.,I won’t refuse. Feminista’s grandson Joaquin (9 months) sez: Goo goo ga Ma Muh gurgle. I had dreams like that all through grad school. Iara! – I found myself reading your strip with the slow, steady, absorb-all-the-details-and-double-entendres (but don’t get to the end too quickly-savor the gradual build) pace of one of Alison’s! It almost sated my need for another D2WO4 ep! Woo-hoo! Clap! Clap! Feminista, I could wax w/you abt Dylan, too. I loved the film and kind of keep him on his perch simply for the music — I don’t want to know the person. And since all things lead to cats. Here comes my Nelly-boo now! Thanks,ready2agitate,for following my train of thought. The title “Well I’ll be Damned” triggered D & R which starts with that line,and then I was off and running. I had a Manx named Susan Gilbert. But Sally Bowles is better. That he was dissing her mad skills… but I dunno. Gonna go google and seek some confirmation. Otherwise, I’ve been singing that song incorrectly for a good long time. where are you calling from! even if the rest of her poetry was lousy. Aunt Soozie,yer right; I’m suffering from blog-itis and email-pox,hence the brain blip…I don’t know if Baez’s poetry was lousy,I think her song lyrics are good. Her voice has always soared miles above him,she was and is much more politically committed than he ever was,and yet he broke her heart (cheated with wife #1,Sara L.,while still with Joan). Yeah,I’ve been learning all the dirt on Dylan. Maggie,no,Sally Bowles isn’t cat #3; I was making a veiled ref to the Kit-Kat Club of Cabaret fame. Jasmine and Oreo remain the sole members of the friendly feline family.Fortunately,they’ve been fixed,so each can frolic freely. Liz turned briefly in the direction Beth indicated, but then decided it might be safer not to. Recently Beth’s protective instinct had been reaching almost paranoid proportions, and the last thing she needed was another row. It wasn’t as if she found Mo attractive, anyway, she told herself. She busied herself by filling the trolley with tinned spaghetti-O’s and scanning the shelves for beans. “Well, they are quite politically active,” Liz ventured. Liz decided to hold her tongue and let the storm pass uninterrupted. She wondered how Beth would have reacted if she had produced a son instead of their beloved Elspeth, but decided not to follow that thought too far. She pushed the trolley down the aisle, half-listening to the angry muttering, then suddenly realised that Mo and Sydney were heading towards them. She felt Beth tense beside her, but out of the corner of her eye she saw her spouse fix on her public “cheery” smile, and she managed to turn her own lips up too. Whatever happened, she wasn’t going to lose face. Indeed, Feminista…with Mo’s prediliction for crookneck squash, who knows what could happen in the produce aisle??? LondonBoy, it’s as if you painted the pictures in our minds! Feminista, you are so right about the missing Mo rant. Actually, I tried to write one, but found myself not equal to producing a full-fledged Mo rant. But if you or someone else (LondonBoy?) want to write one, maybe I can redraw that panel and squeeze it in. LondonBoy, with just a few phrases — row, trolley, tinned, quite the worst, cheery — you’ve picked the characters up and moved them clear across the Atlantic. What fun. Aunt Soozie’s kid, I like how you used just a few lines and dots — for eyebrows, eyes, and mouths — to let us know how your characters feel. It’s really funny. I hope you sometimes draw strips about boys who have phony smiles and send the girls on impossible errands, because that definitely happens sometimes too. iara–Feel free to use my mini-rant above (5/9)abt Mother’s Day,perhaps adding something about yet another(insert eye roll) Hallmark holiday. If I try to work on this idea further,I will get even less done than I do,distracted and entertained as I am by other blogs (MOC,Watershed,etc.),emails,etc. LondonBoy – nice. very, very nice narrative of the grocery store run-in (actually it reminds me of two Mo grocery store scenes, though one i think was w/ her & harriet). loved the flipping of perspectives. this would make a wonderful regular feature / collaboration. FYI, Femininista, Joan Baez also said in an interview with Rolling Stone that she “never identified with feminism” because all kinds of people are suffering and not just women, or some horseshit like that. (This was in the RS Women in Rock issue, I think in 1998.) So I don’t know about her being more politically committed than Dylan. And I’m sorry, but her music blows. DeLand,tis true that Baez has devoted her political energies,starting in the late 50s,to peace,civil rights and international human rights issues. However,she has lived a very independent life,divorcing her husband in after a short marriage because she needed her solitude. At one point she described herself as bisexual. I don’t know if the woman in question was Janis Ian,as Maggie suggested above. I guess we’ll just have to agree to disagree on her music. Nope. Not Janis Ian. Sorry I’m so vague on the date of the RS in question, but its the one with Madonna, Tina Turner, and Courtney Love on the cover. My beef with Baez is specifically that I hate it when women claim that they’re not feminists because they are dedicated to some supposedly more all-encompassing human rights issue, as if the fact that there are many, many suffering people in the world changes the fact that women are subject to specific, gender-based oppression. I think that many women who specifically identify as “independent” feel this way, i.e., feel they are so independent they couldn’t possibly benefit from political and social ties with other women. Whoops, I thought that Feminista was suggesting that the woman in the RS interview was Janis Ian. Misread that one. DeLand,remember the quiz about which DTWOF character we most resemble? I’m a mix of Stewart and Mo. ‘Cept I don’t rant and kvetch as much as Mo,and haven’t ditched the car like Stewart. Baez holds a place in my burgeoning feminist/leftist consciousness as an important figure. My first boyfriend,mentioned above,indentified with Dylan. In retrospect, I was glad to have a role model of sorts in a time dereft of visible strong women in those pre-Women’s Liberation Movement days. I don’t read Rolling Stone.